Loggerhead “exchanges” between study sites. Tracks of satellite-tagged adult female loggerheads (Caretta caretta) 119941 and 119946 during the inter-nesting period in 2012 (A); tracks of satellite-tagged adult female loggerheads 108172 (2011) and 119940 (2012) during the inter-nesting period (B). Gulf Loggerheads were always thought to be homebodies. After the females nested, they would make a home at their local beach. They would never travel too far from familiarity. But, these threatened female loggerheads are more curious than scientists once thought. A new study suggests that the turtles nest in different places–laying eggs on the coast of Louisiana one week and traveling hundreds of miles to make another home in Florida weeks later. The authors of the U.S. Geological Survey study say that the travel routes–which may be littered with leftover oil and increased predators–pose a greater risk to the sea turtle population. The conservation efforts may need to be modified to reflect the findings. “The satellite data and our observations on the ground tell the same story: loggerheads in this subpopulation nest at multiple beaches, sometimes hundreds of miles apart,” lead author Kristen Hart, a USGS research ecologist, said. Co-author and USGS biologist Meg Lamont said that simply protecting beaches that are known to be highly populated with sea turtle nests may not be enough. “These data show it is not sufficient to just protect habitat around high density nesting beaches – such as the St. Joseph Peninsula – because many turtles that nest on the Peninsula use the entire region from the eastern Florida Panhandle to Louisiana,” said Lamont. Hart said she and her team are continuing to map out the travel routes by tagging the turtles. 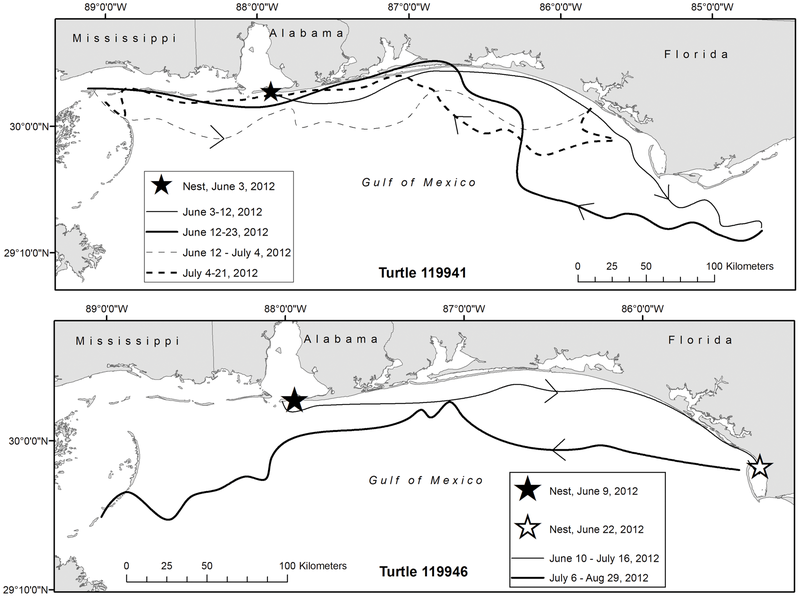 The study, “Movements and Habitat-Use of Loggerhead Sea Turtles in the Northern Gulf of Mexico during the Reproductive Period,” was published July 3 in the journal PLOS ONE.